I love coming up with different ways to use the toys we already have in our house. 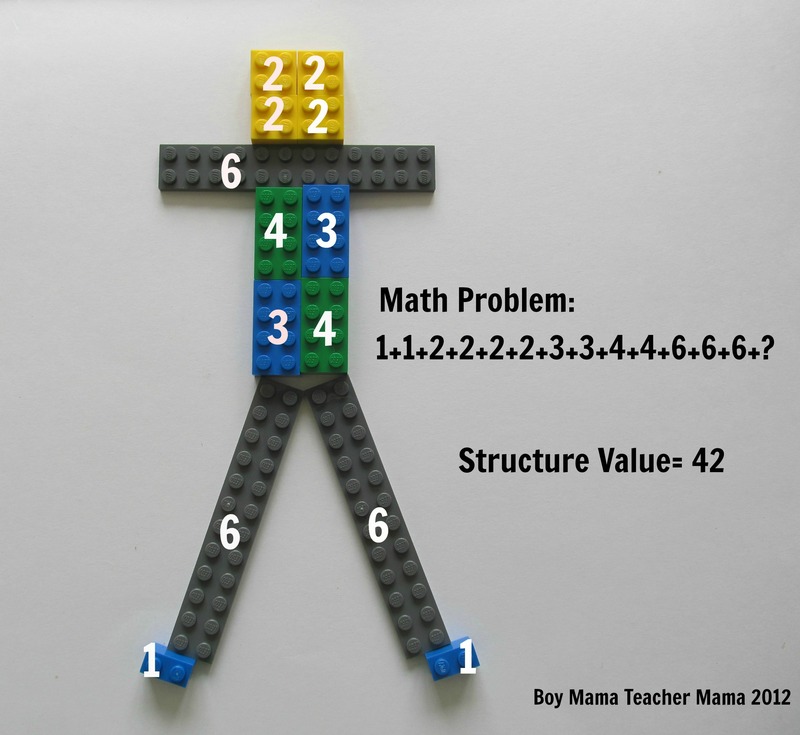 We all know how to use Legos the “right” way, but have you ever tried using them to practice math skills? Well, here is one way to do just that! 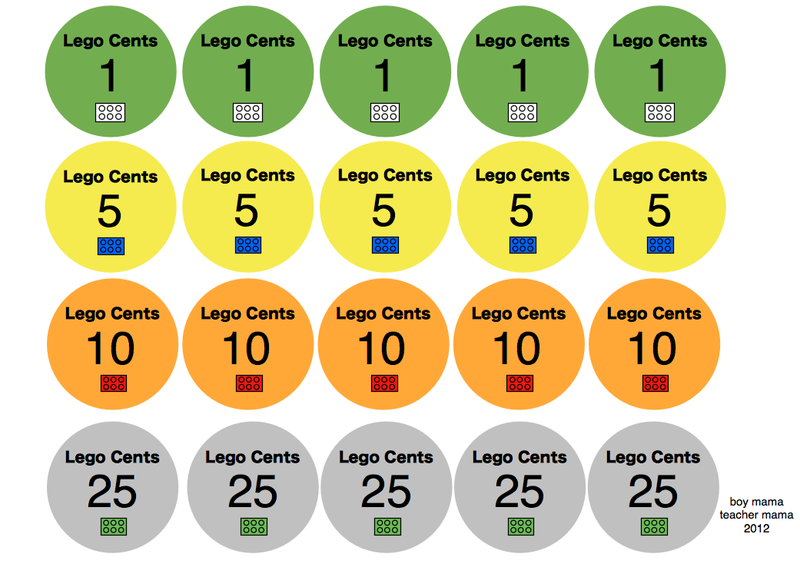 Choose 6 sizes/colors of Legos (see example). You can always use more or less depending on the age of your child. Assign a value to each type of brick. 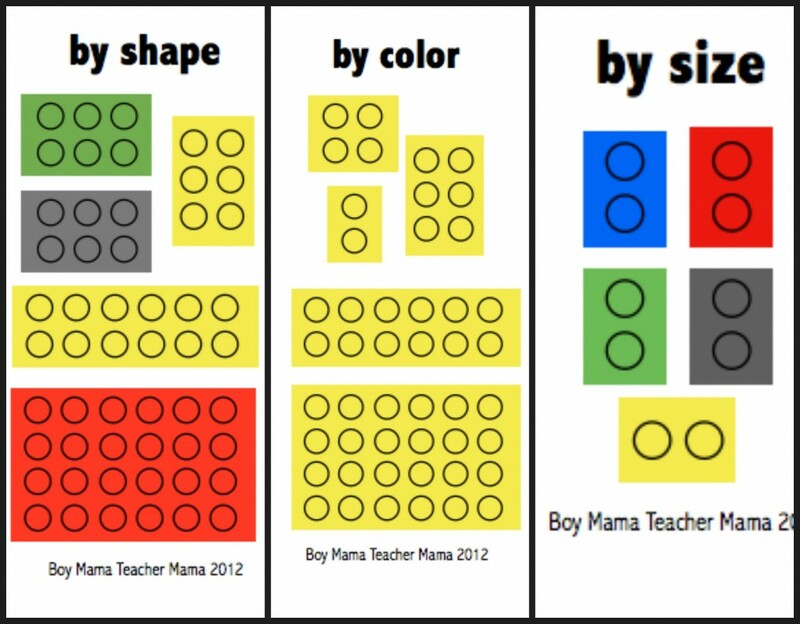 Use smaller numbers for younger children and higher numbers for older children. Give your child a pile of these bricks only. The quantity of each color is up to you. I suggest fewer choices for younger children and more choices for older children. 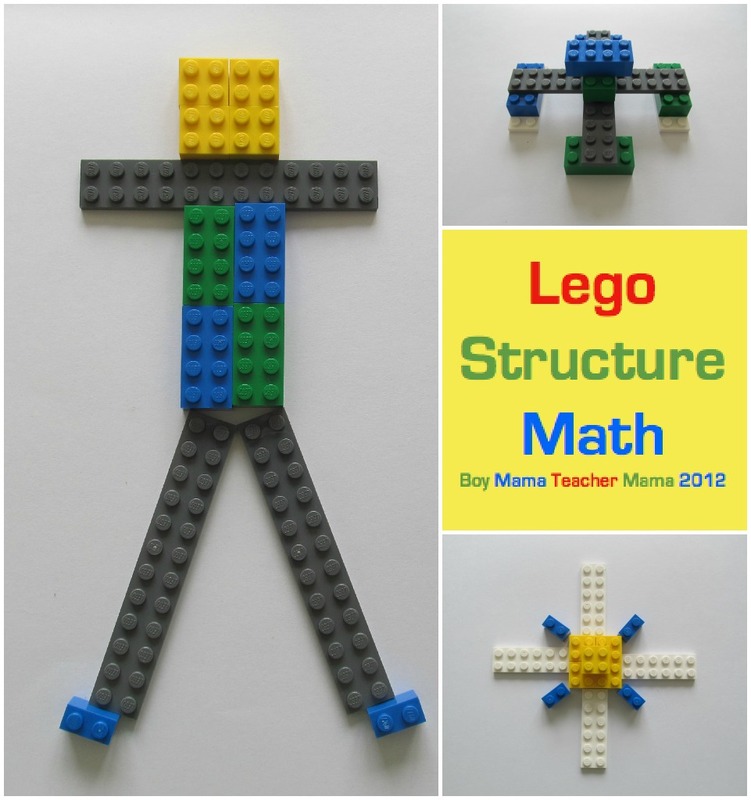 Have your child create a structure using the chosen bricks. He can use as many or as few of these bricks as he likes. Set aside any unused bricks to avoid confusion. Then using a piece of paper (or other method that works for your child), have your child create a math sentence using the values you assigned earlier and then add the numbers together. There are so many ways to extend this activity. Here are a few suggestions. Try making a structure with a smaller value than the first one made. Try making a structure with a larger value than the first one made. 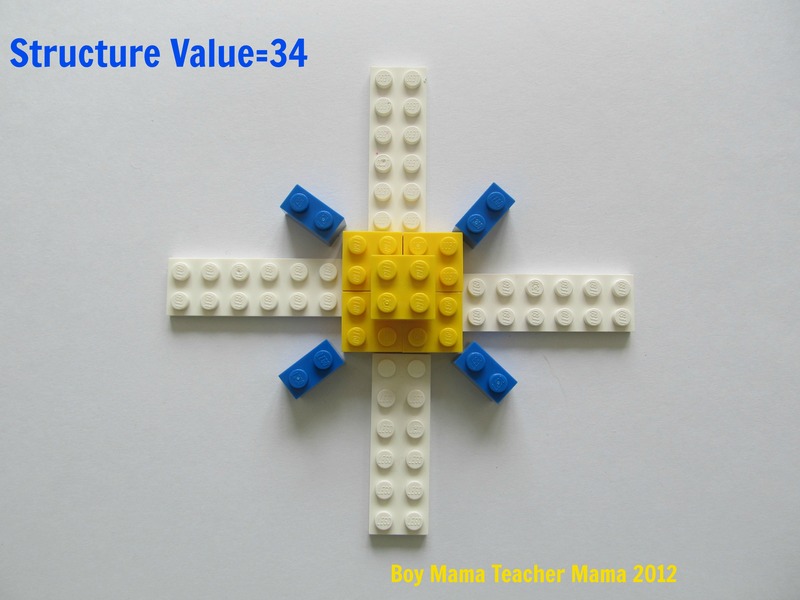 Assign a value and have your child build a structure that adds up to that value. 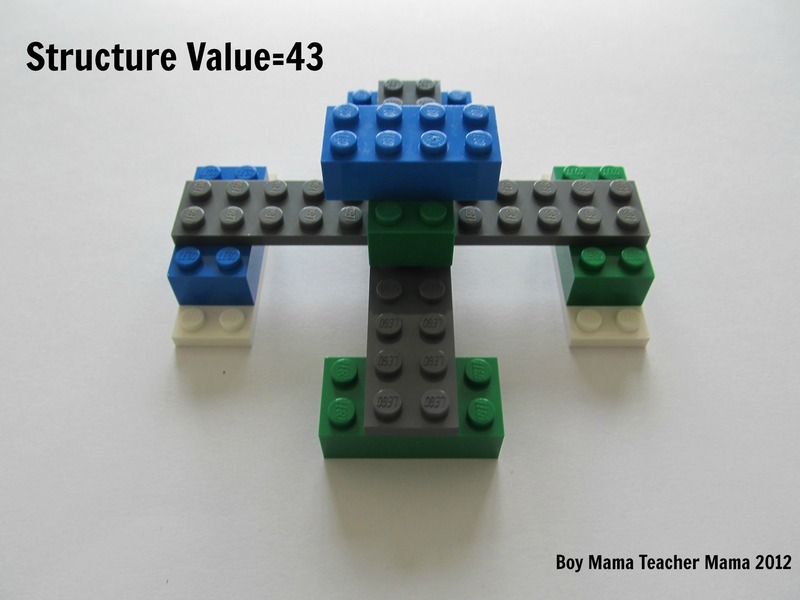 For example, challenge your child to build a structure whose value is 25 and see what they come up with. 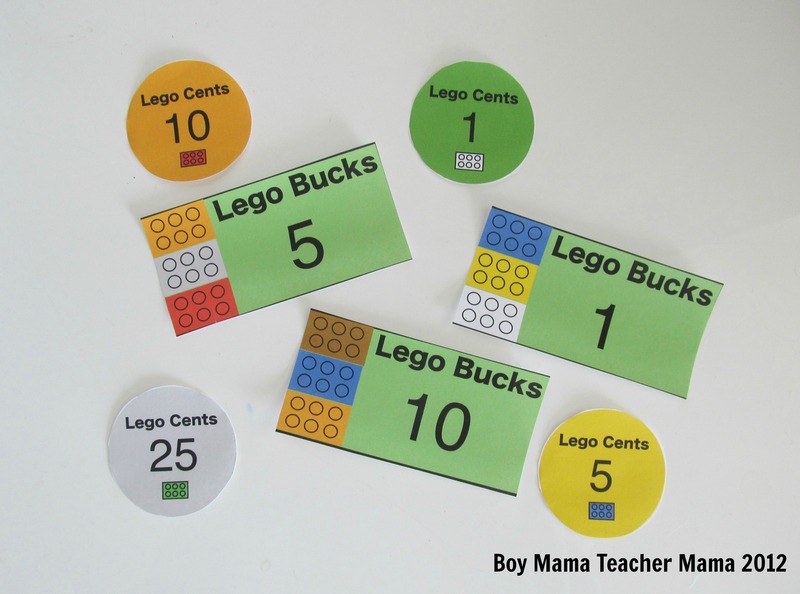 Assign each brick a price and give your child some “Lego Bucks.” Have him use his money to purchase the bricks he wants to use in his structure. You can give a monetary limit to spend or simply have him build and then figure out the value of the structure at the end. This activity can be as simple as you want or to make it more challenging, try incorporating the skill of making change. 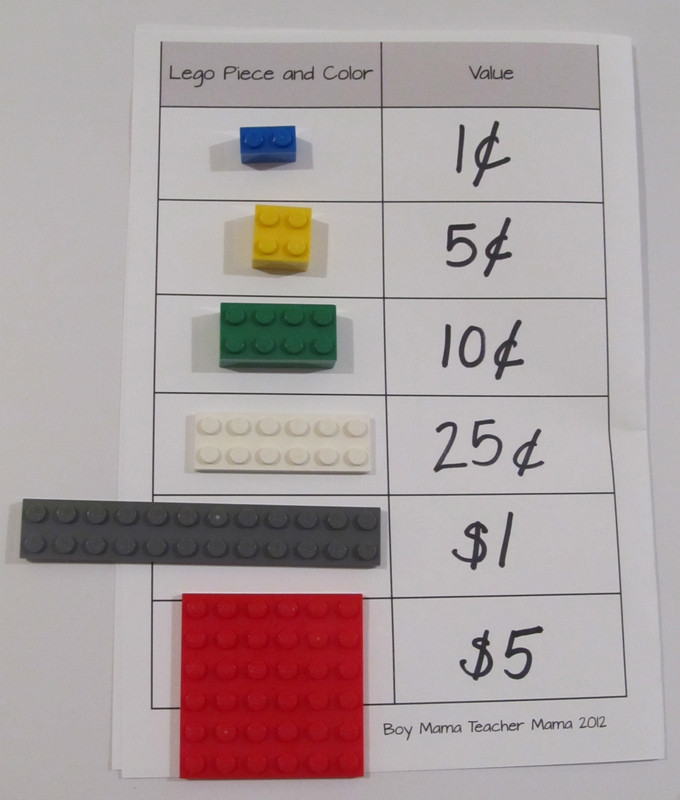 For example, tell your child to make a $7 structure and give him a $10 Lego Buck to pay for the bricks. 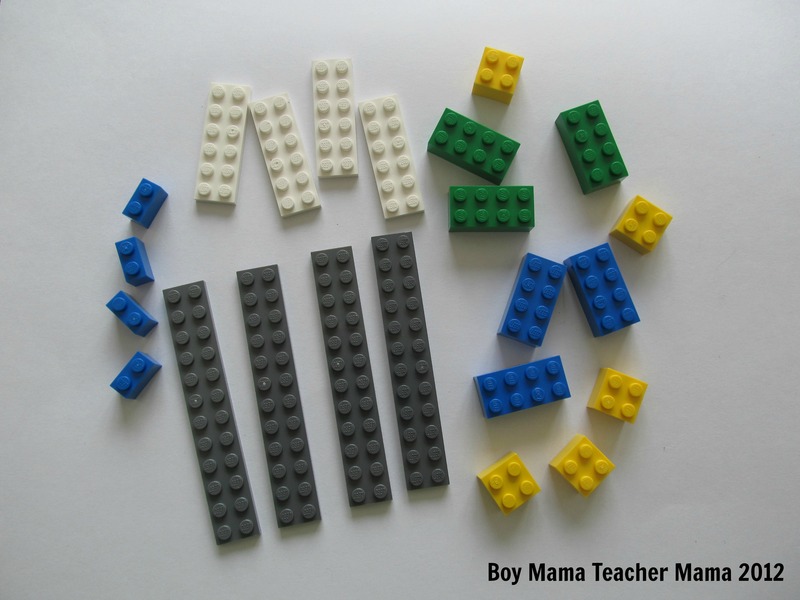 Use the bricks to practice making and extending patterns. 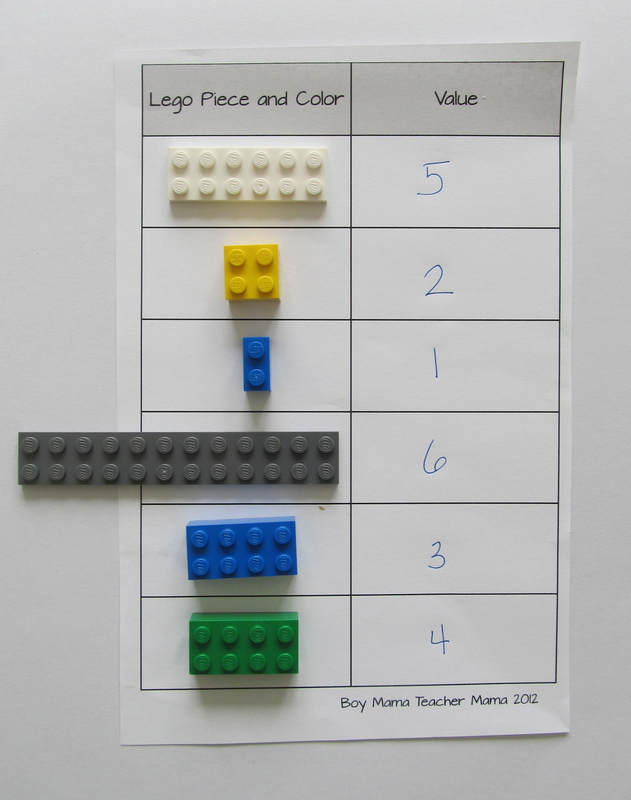 Use the bricks to practice sorting by attributes such as color, size and shape. 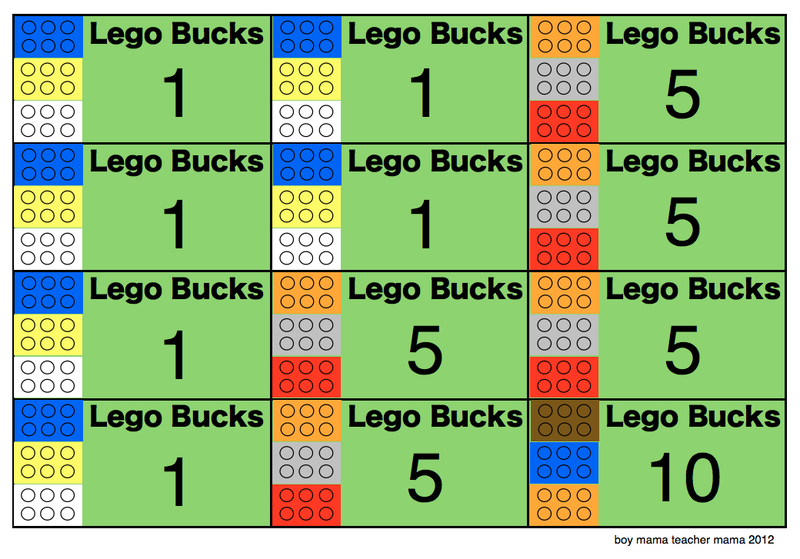 Use the bricks to practice counting skills. 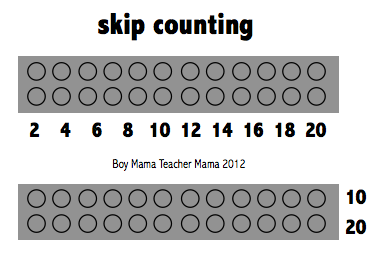 Use the bricks to practice skip counting. 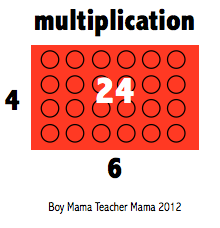 For example, if you have a 2 by 6 brick, try counting the number of dots on the brick by 2s. Or, a 4 by 5 brick can be used to count by 5s. Want a challenge? Use the same bricks to count by 4s or 6s!! Here is an example with a 10 by 2 brick. Use the blocks to practice multiplication. If you have a brick that is 2 by 6 and want to know the total number of dots on the brick, multiply 4×6 to get your answer! I saw that too and wanted to comment, but was on my phone and it is all funky. i love yours too. going to use it with my 3 year old. Geeze Steph, how do you come up with such fabulous ideas! 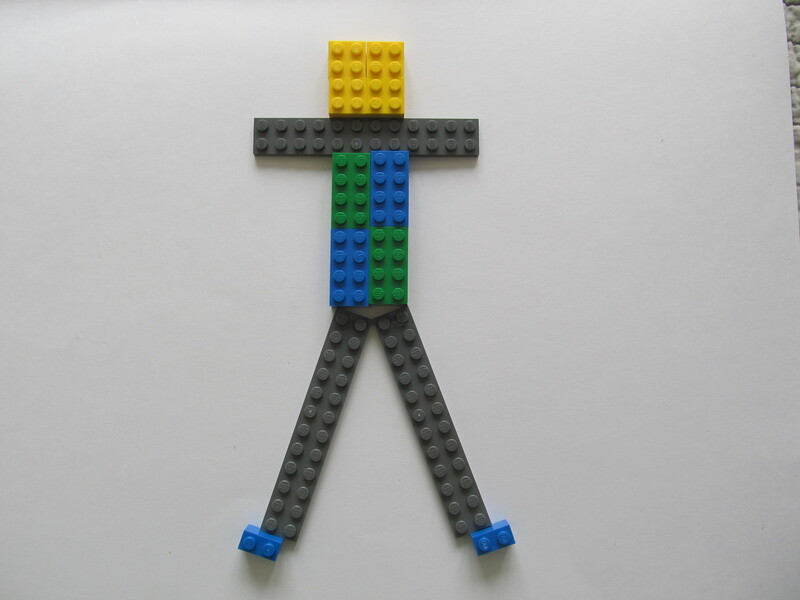 This is brilliant – something I wouldn’t have even considered doing with lego! Now, I wish I HAD lego! It’s on the list ffor when the Twinkles get a little older. I better bookmark this one! You even make math fun!!! 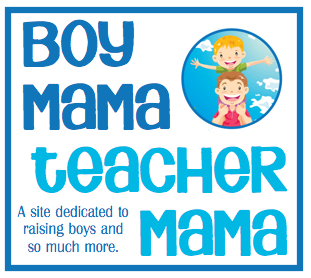 What a clever mama…i love the thought behind this! What a fun way to explore number sentences.